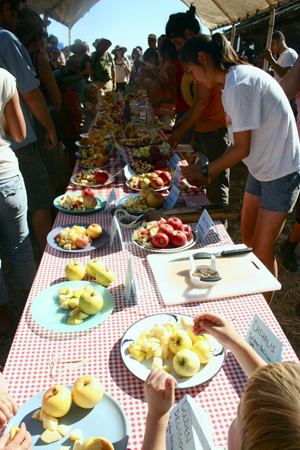 Apple tasting is one of the many activities at the UCSC Fall Harvest Festival. The apple pie baking contest is a favorite for bakers and tasters alike. Celebrate the bounty of fall at the 17th annual Fall Harvest Festival, Sunday, September 25 at UC Santa Cruz’s 25-acre organic farm. The festival features live music, hay rides, kids’ crafts, an apple variety tasting and apple pie contest, pumpkin and produce sales, and campus and community group information tables. Also on tap—workshops on making chutney and other apple treats, saving seeds, making compost, and “cupping” the perfect cup of coffee, along with farm tours and herb walks through the garden. The festival will take place at the UC Santa Cruz Farm on Sunday, September 25, from 11 a.m. to 5 p.m. Admission is free for UCSC students, kids 12 and under, and for members of the Friends of the UCSC Farm & Garden; general admission is $5. See below for a full schedule of the day's events. Want so see how your favorite apple pie recipe measures up? Be sure to enter the Apple Pie Contest by 12:30 p.m. (see rules, below). The Harvest Festival is cosponsored by the UCSC Center for Agroecology and Sustainable Food Systems (CASFS), UCSC’s Measure 43, and the Friends of the UCSC Farm & Garden, with major support from New Leaf Community Markets and Stonyfield Farm, and additional support from Veritable Vegetable. People Power will provide free valet parking for bicycles. For directions to the UCSC Farm, visit the CASFS web site at http://casfs.ucsc.edu/about/directions-2. Free parking will be available at the Campus Facilities and Barn Theater parking lots, and a free shuttle will be available. For more information call (831) 459-3240 or email casfs@ucsc.edu. Peter Weiss & the Earth Rangers 12:15 – 1:30 p.m.
Apple tasting 11:30 a.m. – 4 p.m.
Apple pie contest Entry deadline – 12:30 p.m.
East meets West: Student fusion cooking demo 2:30 – 3:30 p.m.
Composting for gold 3–4 p.m.
Coffee cupping for the perfect cup 3:30 – 4 p.m.
Pie entries accepted 11 a.m. - 12:30 p.m.
Official judging begins at 12:45 p.m. Winners will be announced at between 2 p.m. and 3 p.m.
Contestants are responsible for submitting a written (preferably typed) recipe with their pie. 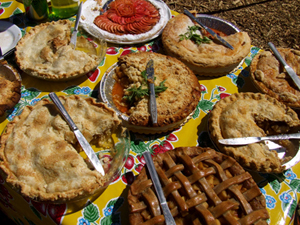 Contestants are responsible for supplying all ingredients and cooking the pie prior to bringing it to the contest. All entries in this contest must be homemade. A representative of the Friends of the Farm and Garden will assign each contestant a number. Contestants should verify the number on the bottom of their container is the same number assigned by the representative. Contestants' entries are judged for taste, presentation, and creativity. The decision of the judges shall be final. Pie not used during judging will be returned to the contestant.